SAS programmers have high expectations for their coding environment, and why shouldn't they? Companies have a huge investment in their SAS code base, and it's important to have tools that help you understand that code and track changes over time. Few things are more satisfying as a SAS program that works as designed and delivers perfect results. (Oh, hyperbole you say? I don't think so.) But when your program isn't working the way it should, there are two features that can help you get back on track: a code debugger, and program revision history. Both of these capabilities are built into SAS Enterprise Guide. Program history was added in v7.1, and the debugger was added in v7.13. I've written about the DATA step debugger before -- both as a teaching tool and as a productivity tool. 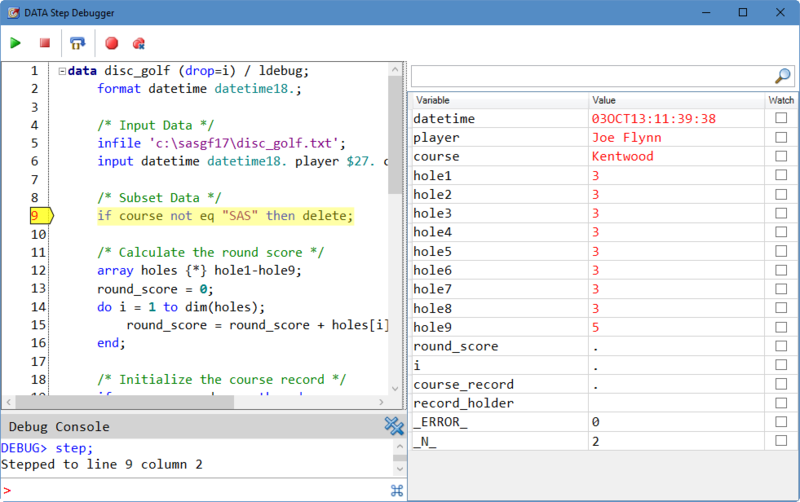 In this article, I'm sharing a demo of the debugger's features, led by SAS developer Joe Flynn. Before joining the SAS Enterprise Guide development team, Joe worked in SAS Technical Support. He's very familiar with "bugs," and reported his share of them to SAS R&D. Now -- like every programmer -- Joe makes the bugs. But of course, he fixes most of them before they ever see the light of day. How does he do that? Debugging. This video is only about 8 minutes long, but it's packed with good information. In the debugger demo, you'll learn how you can use standard debugging methods, such as breakpoints, step over and step through, watch variables, jump to, evaluate expression, and more. There is no better way to understand exactly what is causing your DATA step to misbehave. In the program history demo (the second part of the video), you'll learn how team members can collaborate using standard source management tools (such as Git). 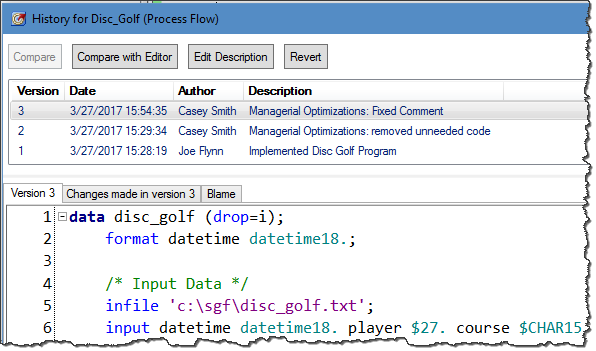 If you establish a good practice of storing code in a central place with solid source management techniques, SAS Enterprise Guide can help you see who changed what, and when. SAS Enterprise Guide also offers a built-in code version comparison tool, which enhances your ability to find the breaking changes. You can also use the code comparison technique on its own, outside of the program history feature. Take a few minutes to watch the video, and then try out the features yourself. You don't need a Git installation to play with program history at the project level, though it helps when you want to extend that feature to support team collaboration. Great Job Chris and Joe - entertaining and knowledgeable all at the same time! Have fun at SGF!